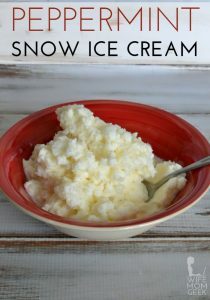 This peppermint snow cream is a delicious and refreshing treat in winter. With only three ingredients, it's so easy that the kids can make it! Gather your snow in a large mixing bowl. Pour the sweetened condensed milk over the snow, and add the peppermint extract. Stir with a large spoon until everything is well combined. Be careful that you don't mix it too much--the snow will begin to melt.